The Monk Poimen the Great (Abba Poimen) was born in about the year 340 in Egypt. With his two brothers, Anubios and Paisios, he went into one of the Egyptian monasteries, and all three accepted monastic tonsure. The brothers were such strict ascetics that when their mother came to the monastery to see her children, they did not come out to her from their cells. The mother stood there for a long time and wept. Then the Monk Poimen said to her through the closed door of the cell: "If thou bearest with the temporal parting from us now, then in the future life wilt thou see us, since we do hope upon God the Lover-of-Mankind!" The mother was humbled and returned home. The saint said: "For a man it is necessary to observe three primary rules: to fear God, to pray often and to do good for people." "Malice in turn never wipes out malice. If someone doeth thee bad, do them good, and thine good will conquer their bad." 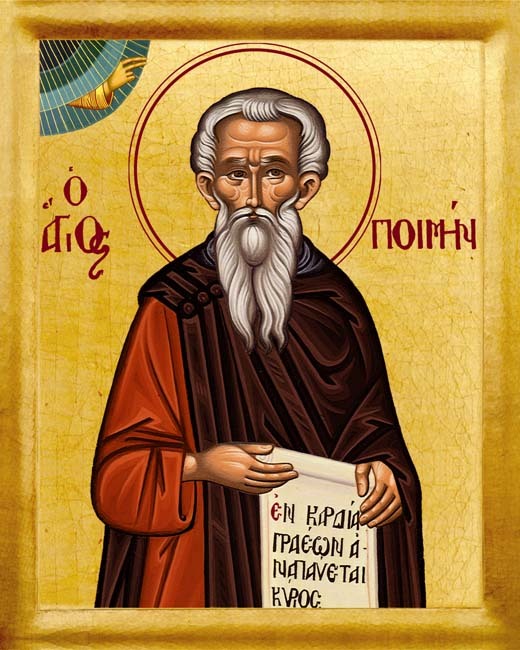 One time, when the monk with his students arrived at an Egyptian wilderness-monastery (since he had the habit to go about from place to place, so as to shun glory from men), it became known to him, that the elder living there was annoyed at his arrival and also was jealous of him. In order to overcome the malice of the hermit, the saint set off to him with his brethren, taking along with them food as a present. The elder refused to come out to them. Thereupon the Monk Poimen said: "We shall not depart from here, until we are granted to see and pay respect to the holy elder," -- and he remained standing in the bright heat at the door of the cell. Seeing such perseverance and lack of malice on the part of the Monk Poimen, the elder received him graciously and said: "It is right what I have heard about you, but I see in you the good deeds and an hundred times even more so." Thus did the Monk Poimen know how to extinguish malice and provide good example to others. He possessed such great humility, that often with a sigh he said: "I shalt be cast down to that place, whither was cast down Satan!" One time there came to the saint a monk from afar, to get his guidance. He began to speak about sublime matters difficult to grasp. The saint turned away from him and was silent. To the bewildered monk they explained, that the saint did not like to speak about lofty matters. Then the monk began to ask him about the struggle with passions of soul. The saint turned to him with a joyful face: "Here now thou well hath spoken, and I must speak for it needs answer," -- and for a long while he provided instruction, as to how one ought to struggle with the passions and conquer them.